This is another corker of a book from Leigh Russell, featuring her increasingly well-known female DI, Geraldine Steel. This is the sixth book about Geraldine’s ups and downs as a police detective and Russell’s talent for writing top-quality crime fiction just keeps on growing. 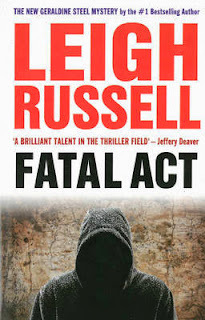 FATAL ACT is a fairly quick read but keeps you guessing right until the end. As usual I finished it far too quickly and am now impatiently awaiting the next instalment. Geraldine is now settling into her new life in London pretty well, despite missing her old friends. Her problems with her sister continue and she is back in the doghouse pretty early on in this novel, as a planned weekend visit from her niece has to be postponed when somebody goes and gets themselves murdered. This case is particularly mystifying. Anna, a pretty, young actress, fresh out of drama school, is killed in a head-on car crash and the driver of the other vehicle vanishes without a trace. Suspicion points its finger at the boyfriend, as it turns out that the other vehicle belongs to him, but he denies all knowledge and when two other young girls die things really start to get tricky. There is a link between all the girls – Ana’s boyfriend - who is a self obsessed womaniser, but Geraldine is not that sure about his guilt. She pays numerous visits to him, to the drama school that all the girls attended and sifts through a lot of dirt. Until, eventually, Geraldine’s sergeant, Sam, unintentionally finds herself face-to-face with the murderer and Geraldine must put everything on the line in order to save her friend. One of the great things about this series is the very real insight into Geraldine’s life and how she struggles to juggle her career, family obligations and private life. She is still unsettled after discovering that she was adopted and her birth mother doesn’t want to know her. She is also continually unlucky in love but doesn’t seem to give up hope of meeting someone. It is also rather nice that she stays in contact with her former sergeant, Ian Peterson, and their friendship now spans two books, as he has his own spin-off series. If you like well-written crime fiction that features a strong female character then I strongly recommend this book, and the others in the series, to you. You are in for a treat! I have read all of Leigh's previous thrillers and have never been disappointed. The high standard of writing, which is both entertaining and thought provoking, keeps you on the edge of your seat and you do not want to put down the book until you reach the last page. I have yet to read "Fatal Act", but it is something I very much look forward to doing.